This article is about the movie. For other uses of the term, see The LEGO Movie (disambiguation). 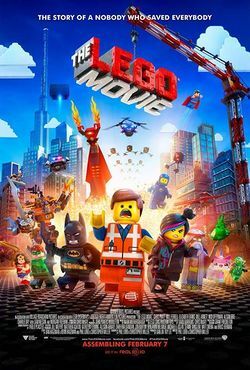 The LEGO Movie, (production name LEGO: The Piece of Resistance and later LEGO: The Motion Picture), is a 2014 computer-animated action comedy film inspired by LEGO. Produced by Warner Bros and directed by Phil Lord and Christopher Miller, the film stars Chris Pratt as a minifigure named Emmet who must save the LEGO universe from the evil doings of President Business, voiced by Will Ferrell. The film was released on February 7, 2014 in the United States and February 14 in the UK. The movie was released on DVD and Blu-Ray June 17, 2014 In U.S.A, Canada, and other various countries, with the Digital Copy for download available on May 20, 2014. Following the success of the first film, Warner Bros. Pictures began the production of a sequel, which will be released on May 18, 2018. The LEGO Movie has since spawned two spin-offs, The LEGO Batman Movie and The LEGO Ninjago Movie. A third, The Billion Brick Race, is also in development. A sequel to the film, titled The LEGO Movie 2: The Second Part was released on February 8 2019. In the beginning of the film, Vitruvius has hidden the Kragle (actually Krazy Glue with dirt obscuring some of the letters) away inside a volcano, and is prepared to guard it from Lord Business. Lord Business infiltrates the hiding place with his Robo SWATs, and as Vitruvius attempts to build some eagles to aid in his defense, the Robo SWATS blind him with a laser, destroying his concentration and his creations. Having no one to stop him, Lord Business takes the Kragle. Vitruvius interrupts his success, proclaiming that there exists a prophecy of a super-talented, creative, and interesting "Special" that will find the Piece of Resistance that can stop the Kragle. However, Lord Business mocks what he assumes to be a made-up prophecy, and kicks Vitruvius into a pit. Eight-and-a-half years later, Emmet Brickowski, a completely ordinary and uninteresting minifigure, wakes up and begins a normal day in his home of Bricksburg. During his day, he joyfully follows the instructions set in place by President Business. Following a day of work at the construction site, Emmet loses his instructions. Upon finding them, he sees Wyldstyle in an off-limits area. When he tries to follow her, he accidentally falls into a sinkhole. After a long fall, he finally reaches the bottom, and he comes across the Piece of Resistance. Mesmerized by it, Emmet reaches out to touch it, albeit against his instructions. After doing so, he is blinded by a vision and loses consciousness. Emmet wakes up with the Piece of Resistance stuck to his back and is interrogated by Bad Cop, who mistakes him for the "Special" and reveals that Lord Business plans to glue the world together. Bad Cop attempts to melt the Piece off of Emmet, using a laser, but Wyldstyle rescues him. Following a chase through Bricksburg, Wyldstyle realizes that Emmet is not a Master Builder when he panics about going against the instructions. They escape into a portal, and as a result of his failure, Bad Cop has his Good Cop side wiped off by Lord Business with a dab of Poleesh Remover of Nieel-A.K.A. nail polish remover. Emmet and Wyldstyle land in the Wild West and don Western disguises. After finding Vitruvius in the saloon, Wyldstyle expresses her dismay that Emmet is not the Special, and explains that she and Vitruvius are Master Builders. However, Lord Business was uncomfortable with the creative and unconventional ideas the Master Builders came up with, erecting walls between realms in order to keep control of the Master Builders. Though Wyldstyle believe Emmet can't possibly be the Special, Vitruvius shows faith in Emmet. A journey into Emmet's mind initially yields disappointing results when Emmet attempts to show off his creativity with a double-decker couch, but after this, it is revealed that he had a vision of The Man Upstairs. The three leave Emmet's mind, and Vitruvius announces plans to meet the other Master Builders in Cloud Cuckoo Land. Bad Cop arrives in Flatbush Gulch, and is told of Emmet's whereabouts by Sheriff Not-a-Robot. Bad Cop and his forces chase the group, and the three escape on a vehicle fo Wyldstyle's. The group eventually lands on a train crossing a bridge over a canyon, and attempt to ride the train away. However, Bad Cop destroys the bridge, sending them all falling to the bottom of a ravine. They are rescued by Batman, Wyldstyle's boyfriend, in his Batwing just in time. They fly away, losing Bad Cop and flying off through Middle Zealand to Cloud Cuckoo Land. In Cloud Cuckoo Land, the group meets the super-positive Princess Unikitty and join the meeting of the Master Builders, revealing Lord Business's plans as well as the arrival of the "Special", Emmet. Emmet gives the assembled Master Builders a speech, in which he mainly asks them for help. After MetalBeard, having failed before to stop Business, asks Emmet what his plan is, Emmet reveals his lack of competence as a Master Builder, leading all gathered Master Builders to abandon the meeting in disgust. Bad Cop arrives then, led by a tracking device planted on Emmet, capturing the Master Builders except for Emmet, Wyldstyle, Vitruvius, Batman, Unikitty, Benny and MetalBeard. Bad Cop pursues them as his forces proceed to destroy Cloud Cuckoo Land. Most of the uncaptured Master Builders escape in a submarine to the Ocean, but the Master Builders' inability to work together means that the sub soon breaks. The last surviving structure is Emmet's double-decker couch, which he built alone as the others worked on the sub. The group hides inside it, evading the Robo SWATs scouring the wreckage of Cloud Cuckoo Land. The captured Master Builders are brought to Lord Business's Think Tank, where Master Builders are forced to come up with his instructions. The group is picked up by MetalBeard, who had previously escaped to his ship and Emmet concludes that the group needs to work together, instead of doing everything separately. Working together is somewhat taboo for Master Builders, as that is similar to using instructions. The Master Builders then come up with a plan to infiltrate Lord Business's Office Tower undetected, and Emmet almost succeeds in placing the Piece of Resistance on the Kragle, but he and the rest are captured. Lord Business kills Vitruvius in a fight, whose dying words are that he made up the prophecy. Lord Business then throws the Piece of Resistance off the edge of the universe, sets his lair to self-destruct with the others (and Bad Cop) still inside, and proceeds to begin gluing the world together, starting with Bricksburg. Vitruvius comes back as a ghost to tell Emmet that, while the prophecy was made up, it was also true, and that anyone has the power to be the Special if they believe in their capabilities. Emmet, tied to the battery that will set the place to destruct, is inspired and throws himself off the edge of the universe with the battery, saving the others. They escape, and broadcast a message to the world's citizens, using Emmet as an example of how they can all be special themselves. It works, and the citizens convert the world around them into vehicles used to defend themselves from Lord Business. The Master Builders themselves join the fight, traveling to Bricksburg with a Spaceship which Benny enthusiastically builds (having been denied the chance to build a spaceship on multiple occasions). Meanwhile, Emmet lands in the real world, where the events of the story are being played out by a young boy named Finn. Finn's dad, who represents Lord Business and also The Man Upstairs, comes down, and is upset at his son for mixing up his LEGO dioramas, proceeding to glue them back into place with Krazy Glue. In parallel, the citizens of Bricksburg are having their creations re-assembled into normal things by Micro Managers, this time with glue keeping them together forever. Understanding this parallelism and realizing he needs to get back to his world, Emmet falls off a table to get Finn's attention. Finn then sends him back to his universe with the Piece of Resistance in hand. Back home, Emmet builds a massive mech out of construction vehicles to get to Lord Business. However, he is almost overwhelmed by Micro Managers until Unikitty, unable to restrain her anguish at the surrounding events any further, turns into the powerful Angry Kitty and allows Emmet to make his way to Lord Business's floating station. In the real world, Finn's dad is impressed by Finn's creativity, and discovers the minifigure of Lord Business, modeled after him. Meanwhile, Emmet convinces Lord Business that everyone is special, including Business, and should have the freedom to express that creativity. Finn's dad lets his son play with his LEGOs to express his creativity, and Lord Business places the Piece of Resistance on the Kragle himself. Everyone in the LEGO world celebrates the success, with Emmet becoming Wyldstyle's boyfriend, Bad Cop reuniting with his parents, and Vitruvius's ghost looking in on the events. At Finn's dad's announcement that he will also have to let Finn's little sister play downstairs along with Finn, the film ends with DUPLO aliens beaming down in front of the heroes, announcing their intentions to invade. Chris Pratt as Emmet the lead character, "an ordinary, law-abiding, LEGO minifigure who is mistaken for the most extraordinary Master Builder. He's drafted into a fellowship of strangers on a quest to stop an evil tyrant from gluing the universe together." Elizabeth Banks as Wyldstyle, a "tough-as-nails" character. Morgan Freeman as Vitruvius, an old mystic. Will Ferrell as Lord Business, Emmet's adversary. Liam Neeson as Bad Cop/Good Cop, Lord Business' henchman. Nick Offerman as MetalBeard, a pirate who wants revenge on President Business. Alison Brie as Uni-Kitty . Jonah Hill as Green Lantern. Cobie Smulders as Wonder Woman. The plans to develop the movie were revealed in August 2009, and in June 2010 it was announced that Lord and Miller were to direct and script the film. On November 11, 2011 it was revealed that the release of the film will be in 2014 and it would be developed by the Australian company Animal Logic. In March 2012, Phil Lord and Chris Miller stated a possible working title could be "LEGO: The Piece of Resistance" and that story development, character design, and casting would begin shortly. "In the 3 to 4 months, hopefully," Lord stated. This is a description taken from thelegomovie.com. Do not modify it. (visit this item's product page) The LEGO® Movie,” the first-ever, full-length theatrical LEGO® adventure, from Warner Bros. Pictures and Village Roadshow Pictures, opens in theaters February 7, 2014.
perfectly average LEGO minifigure who is mistakenly identified as the most extraordinary person and the key to saving the world. He is drafted into a fellowship of strangers on an epic quest to stop an evil tyrant, a journey for which Emmet is hopelessly and hilariously underprepared. “The LEGO Movie” is produced by Dan Lin (“Sherlock Holmes,” “Sherlock Holmes: A Game of Shadows”) and Roy Lee (“The Departed,” “How to Train Your Dragon”). The executive producers are Jill Wilfert, Matthew Ashton, Kathleen Fleming, Allison Abbate, Zareh Nalbandian, Jon Burton, Benjamin Melniker, Michael E. Uslan, Seanne Winslow, Matt Skiena and Bruce Berman; and co-producer John Powers Middleton. The creative filmmaking team includes cinematographer Pablo Plaisted, production designer Grant Freckelton, editors David Burrows and Chris McKay, and composer Mark Mothersbaugh. Emmy Award winner Chris McKay (“Robot Chicken”) also serves as animation co-director. “The LEGO Movie” is a Warner Bros Pictures Presentation, in association with Village Roadshow Pictures, in association with LEGO System A/S, a Vertigo Entertainment/Lin Pictures Production. It will be distributed by Warner Bros. Pictures, a Warner Bros. Entertainment Company, and in select territories by Village Roadshow Pictures. In a press release before the San Diego International Comic-Con 2013, LEGO revealed there would be 17 new sets released in 2014 based on The LEGO Movie, drawing from several classic themes from Space to Wild West. The press release also stated that there will be a line of Collectible Minifigures based on the movie's characters. Alongside the announcement that sets would be produced based on the movie, it was announced that a video game would also be released based on the movie. The game was developed by Tt games, and follows the same style as most of their previous games, with fifteen levels based on the movie. New gameplay features included instruction building and master building, and the entire game's environment was created to look as if it was made out of LEGO, just like in the film. The soundtrack features different versions of the title song Everything is AWESOME!!! as well as a score created by Mark Mothersbaugh who already collaborated with directors Lord and Miller on Cloudy with the Chance of Meatballs and 21 Jump Street. Tegan and Sara featuring The Lonely Island - Everything Is AWESOME!!! Mark Mothersbaugh - We Did It! Jo Li - Everything Is AWESOME!!! The film has recieved near-universal critical acclaim, and currently holds a 79 on Metacritic, as well as a 96% approval rating on Rotten Tomatoes, being "Certified Fresh". Robbie Collins of The Telegraph called it "pure forward-leaping, backward-dreaming animated pleasure" and gave it four out of five stars, and praising Will Arnett as Batman. Digital Spy also praised Arnett's performance, as well as noting the "moving emotional" third act. As of June 1, 2014, The Lego Movie has grossed $255,436,997 in North America, and $206,400,000 in other countries, for a worldwide total of $461,836,997. The film opened at number one on its opening weekend with $69,050,279, and continued to rank number one for the following two weekends, earning $49,846,430 and $31,305,359 respectively. Characters from licensed themes DC Comics, Teenage Mutant Ninja Turtles, The Lord of the Rings, NBA, Harry Potter, The Simpsons, Speed Racer, and Star Wars appear in the movie, as do original characters from LEGO themes like Ninjago, Classic Space, Adventurers and Collectable Minifigures. The movie consists largely of 3D computer animation in the style of stopmotion brickfilms. Some parts of the movie are actual stopmotion, and towards the end live-action film appears. For a limited time in 2013, 5002891 The LEGO Movie Mini Poster Sticker was included with 10232 Palace Cinema. It is based on the real movie poster and can be used to replace the other movie posters that show what's playing in the Cinema. A sign in the movie reads "Heartlake City" and "Paradisa." Unlike most LEGO movies/shows such as Ninjago: Masters of Spinjitzu, Legends of Chima: The Animated Series, and The Yoda Chronicles, nearly everything in this movie looks like it was built from LEGO bricks, including buildings, landscapes, clouds, smoke, lasers, and explosions. Some objects in the movie resemble real-life objects as they would appear to minifigures, including a lollipop stick, nail polish remover, a band-aid, a golf ball, an X-ACTO knife, an American penny, and chewed gum. The central "Kragle" in the storyline is actually Krazy Glue with some of the letters rubbed off. The word LEGO is never said throughout the film. Brickipedia has a collection of images related to The LEGO Movie. Facts about "The LEGO Movie"
This page was last edited on 8 February 2019, at 15:17.